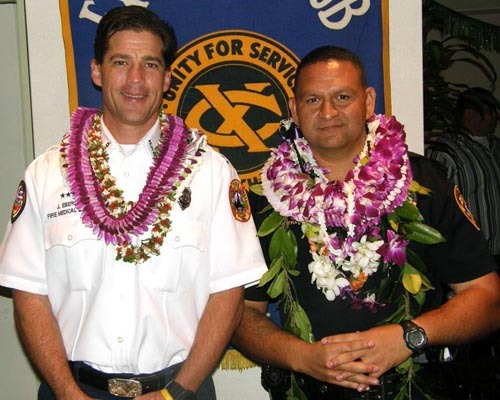 The Aloha Exchange Club of East Hawaiʻi recognized Officer Erhard Autrata as “Officer of the Year” and Captain Jesse Ebersole as “Firefighter of the Year” in a dinner ceremony Thursday evening (March 15). Autrata, who joined the Police Department in 2007, is a patrol officer in the South Hilo District. Ebersole, a 20-year veteran with the Fire Department, is a recently-promoted captain assigned to the Emergency Medical Services Bureau. During a ceremony at the Hilo Yacht Club, each honoree received a plaque from the Aloha Exchange Club, a Certificate of Commendation from the mayor’s office, and a gift basket of donated items and gift certificates. In 2011, Autrata was named “Officer of the Month” in May and again in August for what Lieutenant Robert Fujitake described as his “continued, unwavering commitment” to arresting drunk drivers. In 2010, Autrata led the Hawai‘i Police Department in DUI arrest with 59. Last year he again led the department with 100 DUI arrests. He made 18 DUI arrests in February alone, and another 30 in May. “Autrata has made it his own personal commitment to making the roads a safer place for our friends and loved ones,” Fujitake said in nomination papers. “He is steadfast, reliable and a consummate professional.” Since he joined the Police Department on August 1, 2007, Autrata has never missed a day of work. Autrata credited other officers for helping him with field sobriety tests, processing arrestees and collecting bail. “None of this would be possible without teamwork,” he said. He urged the public to call the Police Department to report any drivers who appear to be under the influence of drugs or alcohol. “Together as a community—it’s the only way we can make our highways safe,” Autrata said. During the ceremony, Fire Chief Darren Rosario said he met Ebersole in a training class in Honolulu some 20 years ago. “That was the start of this very, very good friendship,” Rosario said. He noted that Ebersole now works under the command of Uchida, who was last year’s Firefighter of the Year. “I’m so fortunate to be their fire chief,” Rosario said. Ebersole, who said he was humbled and honored to receive the Firefighter of the Year award, listed the skill set he developed for his work in the field but said those skills “meant nothing in the office,” when he was promoted to captain six months ago. He thanked his family and named several Fire Department mentors who provided leadership to him over the years “We have a great department filled with passionate care providers,” he said. The “Officer of the Year” and “Fire Fighter of the Year” awards are projects of the Aloha Exchange Club of East Hawaiʻi.